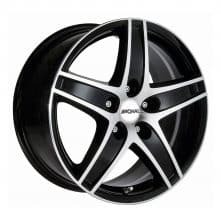 Ronal R48 Trend Jetblack Front Diamond Cut 16 and 17 inch alloy wheels (set of 4 wheels). 16×7.5″ and 17×8″ sizes available. The Ronal R48 Trend Jetblack is a polished spokes and rim, 5 spoke design alloy wheel. The Ronal R48 Trend Jetblack Front Diamond Cut is available in 5 stud fitment for various vehicles. 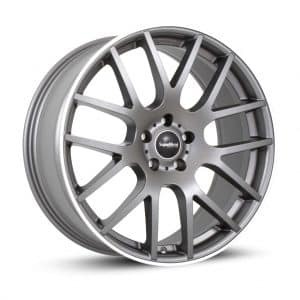 The wheel is available in 5 stud 5×100, 5×112, 5×114.3 and 5×120 fitment. 5×114.3: Newer Subaru, Lexus, Mazda, Suzuki, Toyota, Nissan, Renault, Infiniti, Mitsubishi, Daihatsu, Newest Ferrari, Hyundai, Kia, Jeep, Chrysler, Maserati, Newer Aston Martin, Large Ford, Newer TVR plus others. 5×120: Vehicles such as BMW, Land Rover, Tesla, Commercial VW, Bentley, Larger Mini plus others.